This article was published by several English newspapers, and posted on the websites ThisIsEssex and ThisIsLocal London, in February 2001. February 13, 2001: Late last year, an Australian writer and a South African computer expert, who had first met on the Internet, combined talents to publish what they believe is the world's first multi-national electronic book. Now they have discovered, to their surprise, that they were both born in Essex - in different generations. The free eBook, "Life Begins at Eighty ... On the Internet" by veteran Sydney journalist Eric Shackle, can be found on Barry Downs' Kimberley Web site, http://www.bdb.co.za, linked to other sites in the United States, England, Scotland, Australia and Bangladesh. Articles from the various sites cover a wide range of topics: the world's biggest turkey and largest hailstones, computer-generated anagrams, mysterious lights in Texas and Queensland, 15 towns named Rugby, Global English, and how to cultivate a herb said to ease arthritic pains. Eric, now 81, has written newspaper articles for more than 62 years (one of his earliest stories, published by a Brisbane newspaper when he was 18, is included in the book). He was born in Chingford, which is no longer in Essex, but part of Greater London. He attended South Chingford School before winning a scholarship to Bancroft's School, Woodford Green. but soon after taking it up, migrated Down Under in 1929 with his parents and younger sister, who now lives in New Zealand. 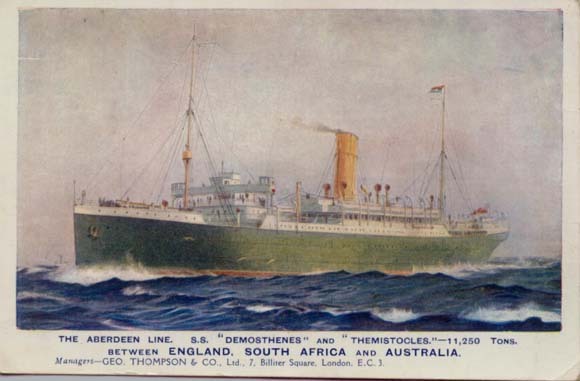 The steamship Demosthenes took six weeks to transport the family and their fellow migrants from London to Sydney. Eric began a long career in journalism and public relations as a copyboy on the Christchurch (New Zealand) Press in 1935, and two years later, aged 17, left the family home for Australia, where he has lived ever since. He served in the Australian Army in World War II, including 18 months in New Guinea, then married a Queensland girl, Jerry, with whom he has lived happily in or near Sydney for 54 years. They have four sons and seven grand-children. Eric was British Petroleum's New South Wales public relations officer in Sydney for 20 years. He retired at 65, and now, at the age of 81, writes as a hobby about any subject that appeals to him, for a global market. Barry Downs, 57, was born in Hornchurch, Essex, in 1944. He spent his early years in North West London , mostly in Kingsbury, Barnet and Edgware. "I first went to Oliver Goldsmith (junior) School in Kingsbury," he recalls, "then to the Haberdashers' Aske's School in Hampstead, although for my last year the school moved out to Elstree in the Hertfordshire countryside. "On leaving school I joined Tube Investments (a large group of engineering companies), through whom I took a degree in Mechanical Engineering at the University of Leicester, graduating in 1966. Two years later I switched to Computer Systems Analysis while still living and working in the English Midlands, in Birmingham, Wolverhampton, Walsall and elsewhere. In 1971 I joined CSO Valuations (the marketing side of the De Beers mining group) in London." Barry's career took a dramatic turn in 1976, when he was seconded to De Beers' Kimberley (South Africa) office for 12 months to help set up their new computer systems. During that period he was offered, and accepted, a permanent appointment in Kimberley. "In 1980 I married Gill (a Kimberley girl) and we have two lovely daughters," says Barry. "Louise was born in 1982 and Tisha in 1988." Barry left De Beers in 1982 to become a successful businessman, first opening BDB Computer Systems, initially marketing Apple computers, designing and writing software etc. In 1988 he established another company, BDB Blinds - a totally different line of business, dealing with window coverings. Asked what he did in his leisure time, Barry said "I was involved for some years with the local repertory company - making a fool of myself on stage on numerous occasions. I was a member of the Kimberley Gliding Club, flying and instructing in sailplanes (not hang-gliders). I haven't flown for a few years, but I have a third share in a single-seater glider and hope to be airborne again before long. Four years ago I started sailing a Laser (a one-man dinghy), and that keeps me busy most Sundays." Barry has been an active member of Rotary since 1982, serving several terms as President and Secretary. For later details, see LIFE BEGINS AT 80... ON THE RADIO, by clicking on ABC.